News reports have covered Dr. Shirazee's invention from time to time. Here is a copy of some of the news items. "Magnetic Suspensions International (MSI) has introduced the MSI Floating System line, which commands attention by keeping products floating in mid-air. The system operates by use of a powerful magnet that is fitted onto the product to be displayed, which is then suspended in air by a magnetic field produced via a generator. The MSI Floating System can keep in suspension any object weighing up to 3.3 pounds. Eight different models are offered. For more information, contact MSI SARL, Rue des Tonneliers, Zone Industrielle Les Dorices, BP 60, 44330 Vallet, France; Tel (011.33) 2 40 36 65 40, Fax (011.33) 2 40 36 65 35." " My first 'find' - tah-tah! - is the football hanging in thin air. Yes! Supported by nothing, no wires, no invisible plastic; no! Just hanging there, free on all sides. No strings, no mirrors - just hanging there, and turning. The company, Magnetic Suspensions International, is pretty happy to have sold an in-store display to Addidas for the World Cup. On the other hand, if you look at this 'suspension' thing long enough, you will think of suspending something too. How it works is ultra-secret, but it only requires a bit of electricity - one or two watts - to make a football or a globe float in the air. The secret part is small, so it should be able to fit into almost anything. It's up to you to figure out what 'anything' may be. The French company holds all rights except for the UK." "Advertising and marketing people will like the new display medium offered by Magnetic Suspension International (MSI): the MSI Floating System. 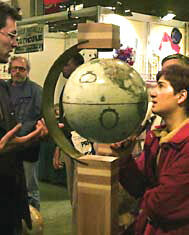 A magnet attaches to the product on display. 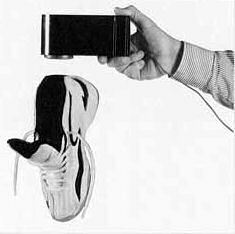 A magnetic field, produced by a generator, suspends the product mid-air. Silent in operation, the system can keep objects weighing up to 1.5 kg in suspension. Only 2W of energy are needed to function properly. Used by a number of exhibitors at last April's Hannover Fair, MSI's Floating System is good for stores, showrooms, offices, and trade shows. Call Damien Vailhen, MSI SARL, at +33 2 40 36 65 30, or fax: +33 2 40 36 65 35." "Katharine Willson, of the Magic Penny Society, with a pyramid of magnetically levitated pennies at the science festival. The system, developed by Nabeel Shirazee for Magnetic Suspensions Ltd, uses powerful permanent magnets supplemented by electromagnets controlled by electronics circuits. The movement of the levitated mass is tracked and the current constantly adjusted to correct any movement, a system that means large masses can be levitated with very modest currents. Barry Jones, managing director of the company, which is based in the Isle of Man, says that among the first products will be a geographical globe for an American company. In industry the system could be used for painting objects automatically and all over in one pass. Plane-makers could use it to support model aircraft in wind tunnels. The display at Birmingham was put on with the Magic Penny Society, which raises money for cancer care. Professor Robin Willson, the society's organiser, said the applications of the principle were limited only by the imagination." Puerto Madryn is famous for the whales that breed in its clear sheltered waters. Every year the town celebrates the anniversary of the landing of the first Welsh settlers. British penny coins are made in Wales. 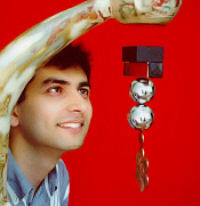 The levitation apparatus, that can make them float in the air, was designed in Wales by Nabeel Shirazee. As part of the civic festivities 2000, the Intendente (Mayor) of Puerto Madryn, Julio Aristarain, joined the staff and children of the town´s science club in an interactive workshop on magnets and money. Just a few days earlier, thanks to the HSBC bank and Dinar Airlines, 10,000 freshly minted pennies, dated 2000, had been transported to Patagonia from the Royal Mint in Llantrisant, Wales. The workshop was introduced by María Victoria Canullo, the other coordinator of Magic Penny Patagonia. María Victoria introduced Robin Willson, one of the founders of the Magic Penny Society and Trust in London. In 1996, they had met Nabeel Shirazee in Cardiff, the capital of Wales. 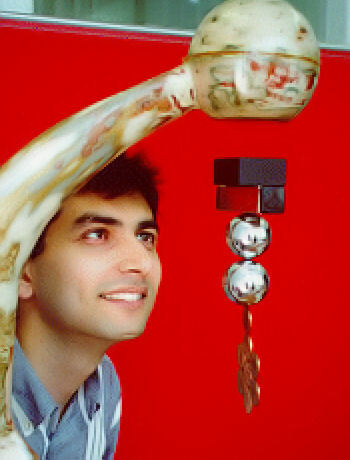 Nabeel had invented the amazing levitation apparatus: some of them had already seen a picture of the apparatus in the local newspaper. María Victoria described, how unlike Argentinian coins, the British one and two penny coins dated 1993 and later, could be attracted by a magnet. They are made mostly of iron. Using a simple horseshoe magnet, and the specially designed magic penny magnet, she showed some of the interesting things that could be done with the pennies because of their magnetic properties. The picture of the floating triangle of 55 pennies featured on the front page of the English National paper, The Daily Telegraph, was displayed on the wall. The intendente and children were soon trying to copy it with the new pennies. They also had a lot of fun making a coin, suspended from another coin attached to a magnet, spin by blowing it using a straw. A coin could be made to spin at over 1000 revolutions a minute without becoming detached. At a science festival in Scotland a girl had managed to keep a two penny coin spinning for one hour a world record. It was hoped that the children would enjoy looking for other things that could be done with their own Argentinian coins as well as with their new magnetic coins.